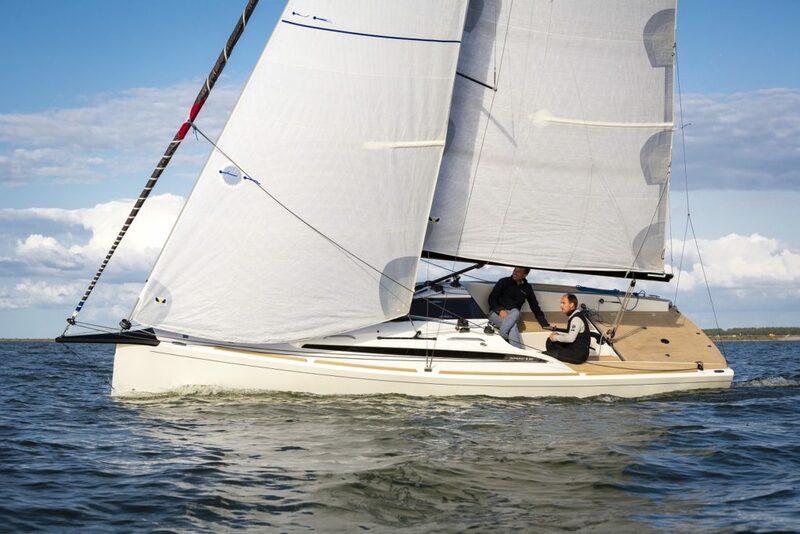 The Belgian yacht builder Domani Yachts introduced their S30 sailing boat at the Düsseldorf Boat Show in January 2018. Their first ever sailboat immediately became a hit with the general public and was hailed by the international press. What started as a small and innovative project, has now grown into a mature production yard. It began when the firm’s founder Michael Goddaert built a prototype in a small yard in Brecht, Antwerp. The team expanded professionally and Goddaert has been joined by business partners Tom Blommaert, Dirk Vael and Jan Goderis. All are passionate yachting enthusiasts, and each have been commercially successful and bring international sales and production experience, to the firm combining local talent and competencies. The Dutch naval architect, Peter Bosgraaf and the Flemish designer Jonathan Anthierens, first built a 3D model of the boat from which the moulds were made. Their brief was to create a lightweight yet sturdy craft. It had to combine sportiness, performance and direct steering with a timeless look, the comfort and luxury of a pure sailing yacht. 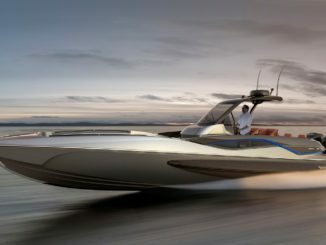 It seems now that the designers fulfilled their brief to the full, creating a highly seaworthy, compact yacht where sailing sensation goes hand in hand with the look and feel of larger yacht. 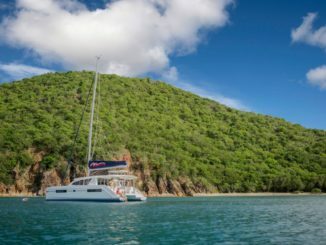 The cockpit aft is ideal for sitting in or sunbathing and offers easy access to the water for swimming or snorkelling. The interior is in turn luxurious, comfortable and bright. The low water line completes the sensation giving the impression of being at one with wind and water. Built around a sandwich core ensures stiffness and keeps the boat lightweight, ideal for the optimal sailing sensation. Ecologically sound materials are employed during the build which features synthetic deck coverings. An electric motor the only option, further increases her green credentials. 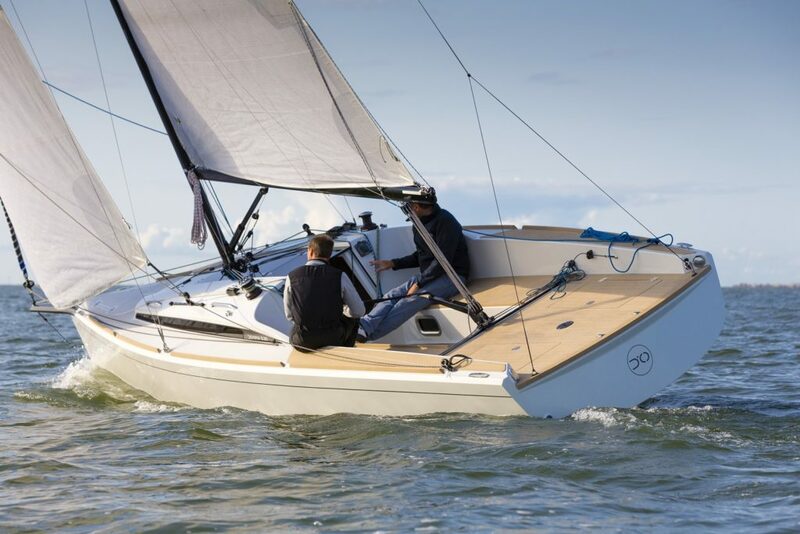 Handmade in small numbers using only the very best construction materials, quality brands the likes of Harken fittings, Seldén masts, Jefa steering systems and Sunbrella upholstery are all fitted as standard, as are the latest generation of Raymarine instruments and displays. Because of her compact dimensions and lightweight construction, the DOMANI S30 can also be towed by trailer to the waters edge. 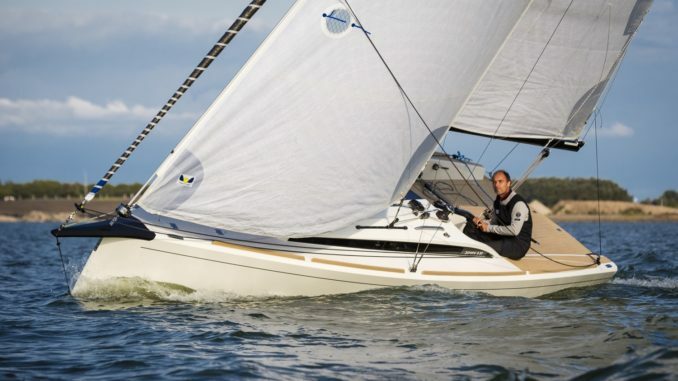 This makes her ideal for leisurely weekend cruising or performance class racing. Once the sails are up, the boat is fast, manoeuvrable and extremely seaworthy. The generous sail plan offers a code zero and gennaker sail, flown from her bowsprit. 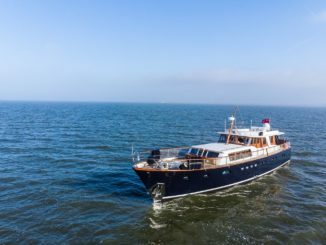 In January of this year the pretty 9-metre yacht was nominated for the prestigious ‘European Yacht of the Year Award’. 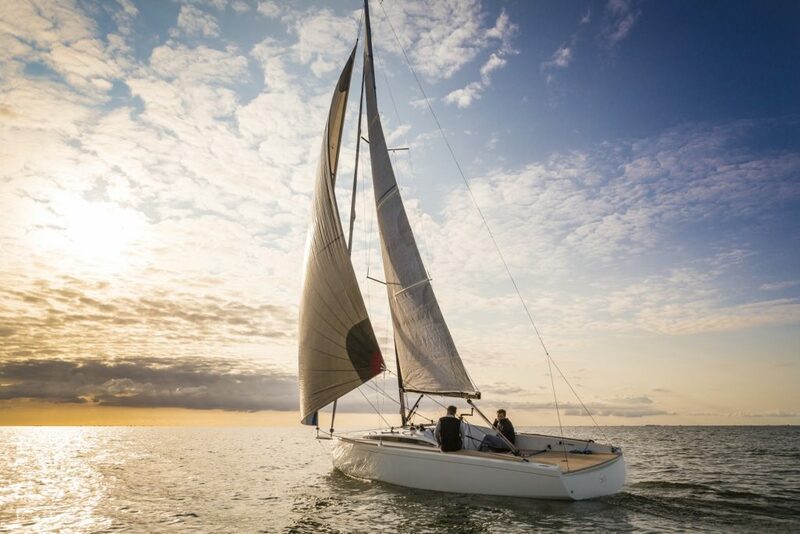 Often referred to as the ‘Oscars’ of the sailing world, the EYOTY Award is one of the most important and influential boat-building prizes worldwide. It is recognised by an international audience of numerous sailing enthusiasts, boat owners and industry leaders. Yachting journalists from 12 magazines from all over Europe form the professional jury. Each of them is a leading voice in their respective countries and all are internationally respected. Late last year in Port Ginesta, Spain, the DOMANI S30 was extensively tested by this jury of journalists. They drove her to the limit and concluded she was a good all-rounder that performed extremely well in winds of 25 knots and more.